Image of the full disk of Jupiter from ACS/WFC at 18:42 UT, April 16, 2006. Two filters are shown in red/orange (F892N, near-IR strong methane band) and blue/cyan (F502N continuum/cyan light). The Hubble group that conducted this observation is led jointly by Imke de Pater (UCB Astronomy) and Philip Marcus (UCB Mechanical Engineering). Other team members are Michael Wong (UCB Astronomy), Xylar Asay-Davis (UCB Mechanical Engineering), and Christopher Go, an amateur astronomer with the Astronomical League of the Philippines. NASA's Hubble Space Telescope is giving astronomers their most detailed view yet of a second red spot emerging on Jupiter. For the first time in history, astronomers have witnessed the birth of a new red spot on the giant planet, which is located half a billion miles away. 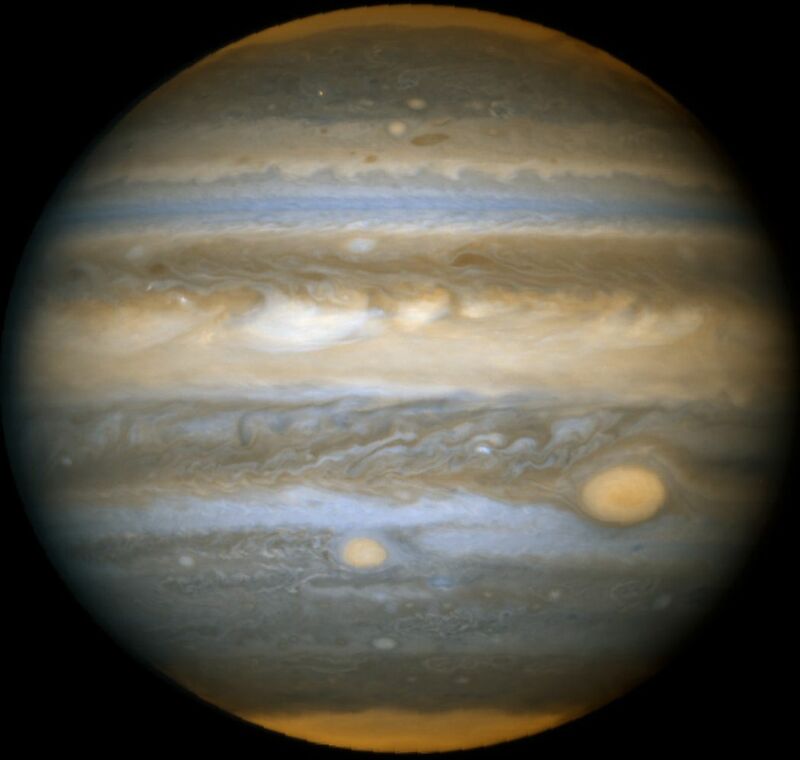 The storm is roughly one-half the diameter of its bigger and legendary cousin, the Great Red Spot. Researchers suggest that the new spot may be related to a possible major climate change in Jupiter's atmosphere. These images were taken with Hubble's Advanced Camera for Surveys on April 8 and 16, 2006.